One of the things The Knot suggests you do is create a "Day Of" schedule and distribute it to the folks in the bridal party. 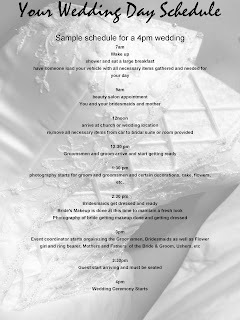 This schedule tells them what time to be where and any other important information for the day of your wedding. It will also include the event timeline for the reception. Let me tell you, I have nightmares about the day of the wedding and they are usually about the scheduling and running behind. As a matter of fact, I just had one last night. My girls were late and not even ready when they showed up. My hair and makeup artist was nowhere to be found and we had an hour to get to the venue. It was a complete and literal nightmare. I am hoping that after this Friday's meeting with the venue coordinator, I can compile a "Day Of" Schedule that will put my mind at ease. I found a great template here to get me started and another much more involved one here. 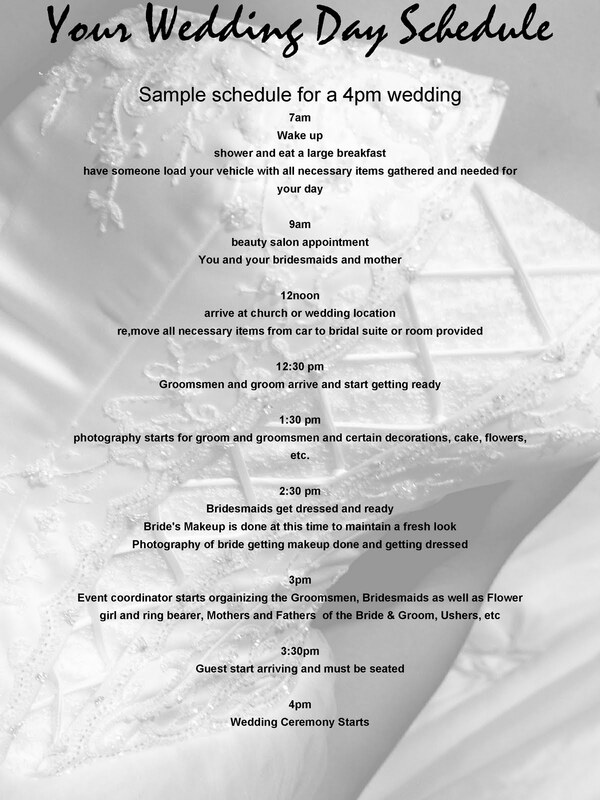 All you really have to do is google "wedding day itinerary" and you can find a ton of resources. I will probably use the first one and tweak it just a bit to add or delete things. Alright brides-to-be and former brides, aside from the obvious, what should I have on this schedule? I was a bridezilla for sure. I was determined to do everything myself on the wedding day, but hubs made me relinquish control. So I did with a day of plan and assignments for all. It was like 9 pages long (single spaced). I would be happy to send it to you too as a template, but in all honesty the schedule gets thrown out the door once the ceremony starts. I would recommend having a schedule for the pre-wedding for sure. Don't forget to schedule some time for the both of you to just breath and take a minute to reflect on the fact that you are both husband and wife!!! Thanks! :) I'll definitely be using this! All of my wedding nightmares are about timing and scheduling as well!!! Really fun, isn't it? I sat down with my photographer to make the "Day Of" schedule. It was so helpful, she knew how long it would take to do pics and then I worked everything around that. I have a tentative one made...just to calm me down. Then I'll tweak it as the day gets closer and more details are planned. I love the ones you found! Super helpful! We didn't have a schedule, crazy right?? I just wanted things to be as relaxed and fun as possible. We also had a night wedding, though, so we had PLENTY of time!! I just told our folks when to be where. But my DOC and I had created the super itemized timeline, along with what family was bringing what items to the ceremony/reception site. And their contact info on there.